From the Old Louisville Information Center building in Central Park, exit west onto Magnolia Avenue. Proceed to the Seventh Street intersection, then turn north onto Seventh Street. Continue north to the Zane Street intersection. See area map. In 1893, as we wind our way through Limerick, we hear the chimes of the St. Louis Bertrand Church bells. Irishmen are, coming home after another hard week's work at the L&N Railroad yards. Some move slowly toward their favorite pub, already hearing the boisterous, laughter and loud arguments about the latest political actions of the local electorate. Others make plans for Sunday's annual Hibernia picnic at Floral Park.. In the central part of Limerick., families and friends are gathering to honor the class of 1893 at the last graduation to he held at Central Colored School. Next year a new Central High will open at 9th and Magazine. It is rumored that the old high school will become an elementary school for white children. 0ne can hear the choir rehearsing "Hold High the Banner of Life," as part of its contribution to the evenings' program. A procession of nervous seniors is forming on the outside lawn to wait for the signal to enter the hallowed halls. Let's retrace the steps of these early Irish and African-American residents as we drive through Limerick. Seventh Street was named Military Road during the Civil War, because the Union Army had several installations in the Limerick area. Built about 1830, it was originally named Oakland Turnpike and was a privately-owned toll road. The drive-through tour begins at Seventh and Zane Streets. Continue north on Seventh Street to the York Street intersection. In the 1800's, Charles A. Deppen had his marble works on the northeast corner of Zane where a grocery had previously been located. This 2 ½ story duplex has Eastlake porches and fleur-de-lis motifs. This style is 1870 camelback shotgun. 1015 was built in 1888 for Mary Dugan, a widow. This was built as State University, the first black institution of higher education in Kentucky. The buildings were designed by Samuel Plato, the most successful black architect of his time and a graduate of the University. State University was later renamed to honor its first president, Dr. W. J. Simmons. Today, Simmons Bible College is located at 18th and Dumesnil. One of the first public housing rental properties in the nation, and the first in Louisville, it has been converted into owner-occupied condominiums for former public housing residents. Built in 1890, these seven identical shotgun/camelback brick cottages have common walls and Eastlake entries. Joseph C. Hemingray, a lawyer, lived in 945. Caroline M. Roath lived in 937. 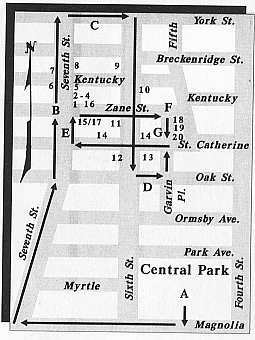 Turn east onto York Street for one block, then south onto Sixth Street. Continue to Oak Street. Known as the Seelbach-Parrish House, this was built by hotel owner, Louis Seelbach. This structure's architecture influenced the designs of other buildings in the same block. The entry is located within a semi-circular keyhole-like opening. Mr. Seelbach's hotel, located in downtown Louisville, at 500 Fourth Avenue, thrives today. Charles Henry Parrish, Sr., purchased the residence in 1919 and lived there until 1969. He was the University of Louisville's first African- American professor and department head. Renaissance Revival "The Schoolhouse," now an advertising firm, was built for $23,000. Originally Central Colored School, it later became a public school for white students and was renamed Mary D. Hill School, after a pioneer organizer of kindergartens. This two-story, red brick town house has painted stone lintels and sills, with an extended cornice underscored by brackets. Notice the interesting landscaping it shares with its neighbor. The Dominican Order established a priory at this location in 1866. The Gothic Revival style church was built between 1869 and 1872 at a cost of $100,000. Three buildings constitute the complex. Community life has been centered around the church since its establishment. These camelback "shotguns" were built between 1885 and 1889 and were owned by clerks, plumbers and traders. At the Oak Street intersection, turn east onto Oak Street for one block. Turn north onto Garvin Place for one block, then west onto St. Catherine Street for two blocks. Enjoy the ambience, where several famous Old Louisville architects built their homes. Among them were Kenneth McDonald (514), L. Pike Campbell (517), and Cornelius A. Curtin (539). Others designed 605, 607 and 609. Note the interesting design of 529-531, in which one side mirrors the other. At the Seventh Street intersection, turn north for one block. At Zane Street, turn east for two blocks. This has a gabled bay, with fish scale shingles in the gable, and an Eastlake porch sheltering the entrance. Its rich color is complemented by scalloped shingles, which fill its gable end, and by a rough-hewn stone foundation. This is an Italianate style built in 1891 by Samuel McKee, Jr., editor of The Louisville Times. The building is ell-shaped, with the primary entrance on the inside of the ell. Note the Flemish-style gable. The porch was added later. One of the first structures built in the block, the total cost of the lot and the house was $6,250. The driving tour ends at the intersection of St.Catherine Street and Garvin Place.